EBT is coming to the Rotary World – but what is EBT? Indications are that Evidence-Based Training – EBT – is coming to the Rotary World – at least in EASA-land. 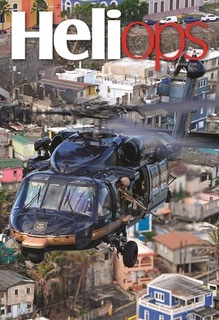 ICAO is also considering the concept in a forthcoming helicopter mission training document. EBT has taken hold in the fixed wing world and is now set to feature in the training and testing of helicopter pilots. But what is EBT, and why do we need to embrace this new-fangled idea? In a nutshell, the idea behind EBT is to drag the industry away from the deadly clutches of the outmoded ‘syllabus’ approach to pilot training and testing and into a world in which a pilot’s overall competence is put under the microscope, flying skills, CRM skills and decision-making skills. It is also known by another name – Competence Based Training and Assessment or CBTA. That sums up the vision of its proponents – that it should embrace a genuine level of crew capability based on rigorous standards applied across a wide range of knowledge, skills and attitude requirements (KSA). These are designed to develop ‘resilience’, the ability to tackle whatever the pilot is faced with in real world situations, rather than simply ‘pass the test’. Before you raise your eyebrows at the emergence of yet another ‘bright idea’ produced by a closet full of nameless regulators you must understand something very important about EBT. It is, as I have just said, a form of competency based training but it is not one based on thin air. Instead it is based on the data that comes from the analysis of millions of flight hours. Thanks to Flight Data Monitoring, Mandatory Occurrence Reporting, Safety Management Systems and Occurrence Review Boards we now know a vast amount about what is really going on out there. In other words, it is based on real-life events involving real people making real mistakes in the real world. b. are given the maximum opportunity to rehearse the test manoeuvres during the TR Course and before each Proficiency Check. This process means that the maximum number of people pass the course despite the fact that probably 50% of them could not be described as fully competent in any circumstances other than those presented in the check. So how does EBT work? First of all, it will probably vary in detail from one jurisdiction to another, but the essential ingredient is an overall assessment of competence by the instructor/examiner over a sequence of training sorties conducted in a ‘scenario-based’ context. It will be difficult to do this effectively without a suitable flight simulator so the introduction of EBT will be dependent on the availability of a good quality Flight Simulation Training Device (FSTD). The advantage of the scenario-based approach to training and testing is that it can be ‘seeded’ with essential manoeuvres required by regulation as well as specific elements designed to help raise a particular individual’s skills in areas that were found to be weak in previous tests. It also presents excellent opportunities to test Human Factor skills such as crew cooperation, communication and decision making. EBT is a programme that, of necessity, is a subjective process. No regular TRI/TRE can just walk into an EBT programme. It will require some dedicated training sessions with an EBT facilitator or ‘tutor’ before an instructor can deliver an EBT course. What is more, there will be a need for ongoing collective assessments by the instructor corps to determine the degree to which they are all singing from the same hymn sheet and using the same metrics. Regular instructor and examiner ‘workshops’ will help and if the workshops can include personnel from more than one organisation then so much the better. This ‘cross-fertilisation will bring many advantages. I was involved with an EBT programme a few years ago, and we saw the need for a dedicated instructor retraining scheme as a fantastic opportunity to raise the standards of some of the weaker members of the training team. This segment of the instructor population would benefit from this review and the opportunity to gain more knowledge and skills and raise their self-confidence. They would also be rubbing shoulders with those who were more experienced and that is never a bad thing. So where does this EBT magic leave all those helicopter pilots that do not have access to flight simulation or whose employers are too small or too poor to afford the use of an FSTD? The short answer is ‘worse off’, but that is not a very helpful thing to say. I don’t know of an easy solution for all those one-man-bands out there save your safety is in your hands. If you choose to read all the accident reports you can get your hands on and learn from the tribulations of others there is a good chance you will not make the mistake that they made, or get yourself into the difficult situation that they found themselves in. There is just an outside chance that if a suitable FSTD is available, then the CRM training required by the regulators could be conducted at the sim-centre and combined with some basic ‘scenario-based’ training in the FSTD with course members sharing the time, cost and benefits. These days I have time to contemplate the adage about the two buckets we are all given on the first day of our flying careers. One is empty and will be used as a repository for the experiences you gain at work. The second contains your share of luck. The hope for every aviator is that the first fills up before the other is empty. I made it so far, and I hope you do too. It is worth pointing out that in the first 30 years of my flying career I lost 30 colleagues whose buckets of luck ran out all too soon. After 30 years I stopped counting. Now I have the luxury of writing about my experiences and swinging the lamp and telling the tall tales about those times when Lady Luck took care of me. His message was clear, so get out there and practice. Book those sim-slots now! Train hard and fly safe.